Undeath does not seem to be covered by PCaPP. I changed the magicka costs of the spells added by the Undeath mod by Antioch08 to be in line with Perkus Maximus values. Perkus Maximus has a mage plugin that radically changes how magic skills work. Instead of spells becoming cheaper to cast as your skill increases, the spells instead become more powerful. The Undeath mod, by Antioch08 adds a lot of new spells, many of which are not influenced by any Perkus Maximus patch by raulfin. 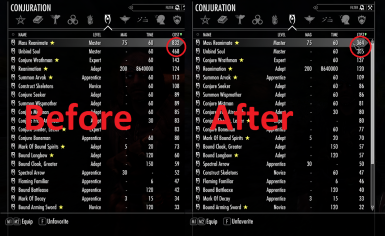 This mod seeks to fix that, by reducing the base costs of all spells that aren't edited by another mod. To do this, I multiplied these values by 0.455 using TES5Edit, effectively slightly more than halving the costs. To install, simply replace your Undeath.esp with the patched esp in the archive.